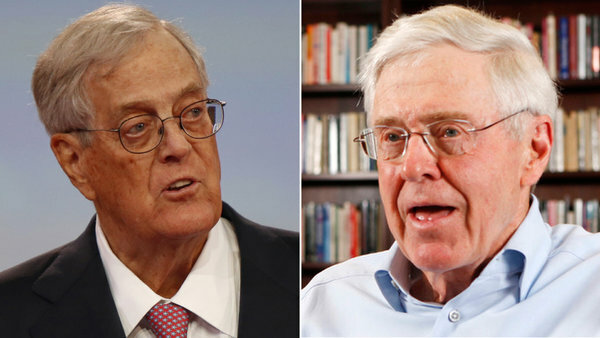 Is Charles Koch the Scariest Man in the World? Scary because he claims "We don't have the power to coerce anybody" while providing massive funding to organizations that attack public education, social programs, worker salaries, business regulations, and the environment. Scary because he refers to himself with words like 'integrity' and 'principles' while saying "I want my fair share – and that's all of it." In Crossett, Arkansas, local waterways have been filled with toxic chemicals by the nearby Georgia-Pacific plant, a likely contributor to the surge in cancer and other illnesses in their community. A spokesman for Georgia-Pacific called the allegations "sensationalized." But the EPA reported that the Crossett plant released 136,000 pounds of toxic chemicals to nearby waterways, and buried over 444,000 pounds in the soil to degrade. A USA Today study ranked Crossett in the top percentile of communities for schoolchildren's exposure to cancer-causing chemicals. More recently, the besieged city of Detroit has become the dumping ground for a three-story pile of petroleum coke covering an entire city block near the Detroit River. The pile is owned by Koch Carbon, a company controlled by Charles and David Koch. The mound of toxic matter has been spewing thick black "fugitive dust" over the homes of nearby residents. 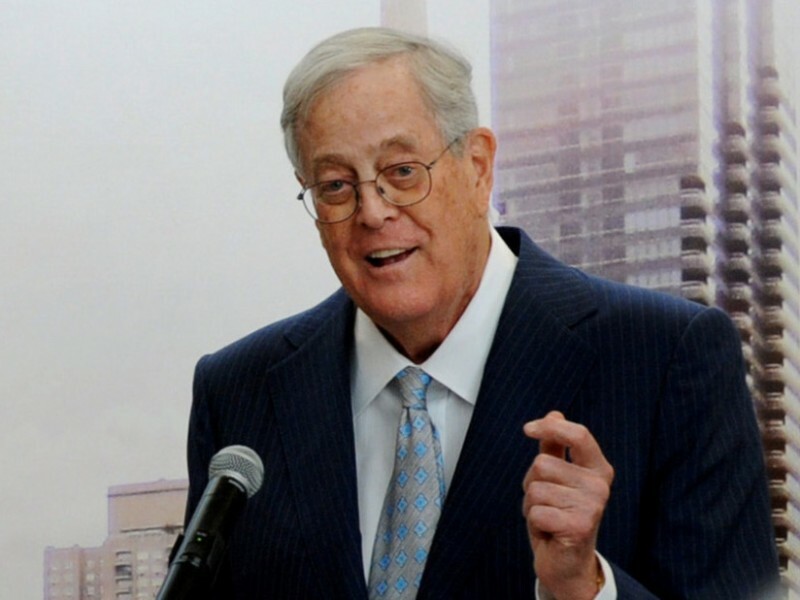 Koch Industries was ranked as one of the top air polluters by the Political Economy Research Institute. 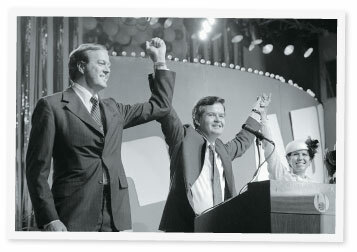 In a 2012 essay Charles Koch further criticized crony capitalism, saying "This growing partnership between business and government is a destructive force, undermining not just our economy and our political system, but the very foundations of our culture." Yet Koch Industries is one of the biggest beneficiaries of oil subsidies and government contracts. According to the Center for Responsive Politics, the company has spent an average of almost $12 million per year from 2008 to 2012 on oil and gas industry lobbying. There's more. Over 100 bills introduced in 2013, backed by the American Legislative Exchange Council (ALEC) and heavily funded by the Kochs, seek to drive down wages, benefits, and worker rights. The Nation reported that free-market libertarian Charles Koch coached economist Friedrich Hayek in the acquisition of publicly-funded retirement insurance and health care. 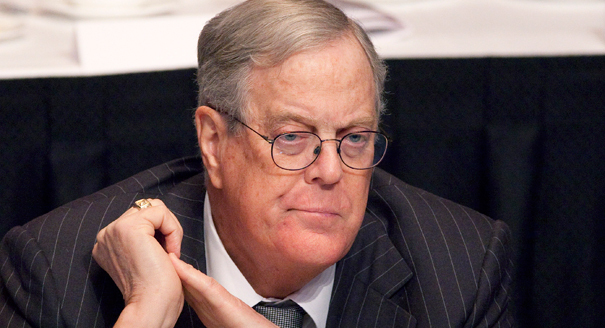 Said Koch, "You are entitled to Social Security payments [and to] hospital coverage." Koch-funded organizations like The Heritage Foundation, The Cato Institute, and The Reason Foundation oppose Social Security, climate change science, gay marriage, and the Affordable Care Act. With stunning condescension toward lower-income Americans who are one emergency away from financial collapse, the Charles Koch Foundation recently released a commercial that ranked a near-poverty-level $34,000 family among the Top 1% in the world. The Economic Policy Institute calculated that a U.S. family of three would require an average of about $48,000 a year to meet basic needs.